Maggie Cooper's barley pomegranate salad. The superfood I can't get enough of at the moment is pomegranate. Full of antioxidants, vitamins, fibre and anti-inflammatories, the arils (not seeds, as they are commonly called) pack a punch visually; their jewel-like appearance makes just about any recipe look fabulous. Australian pomegranates are now in season so make the most of them while you can. They're quite easy to prepare, though fiddly. Cut the fruit in half and peel away skin and pith, turning it inside out to release the arils. Wear an apron if you are wearing white! You can also do this in a bowl of cold water and skim off any bits of pith or the parchment-like membrane that surrounds the arils as they float to the top. The sweet/sharp burst of flavour as you bite into a pomegranate aril is deliciously refreshing. This salad is a traditional dish prepared in the Middle East; I like to use fresh mint and parsley but dill or coriander can also be used. Add some pistachios for crunch if you like. 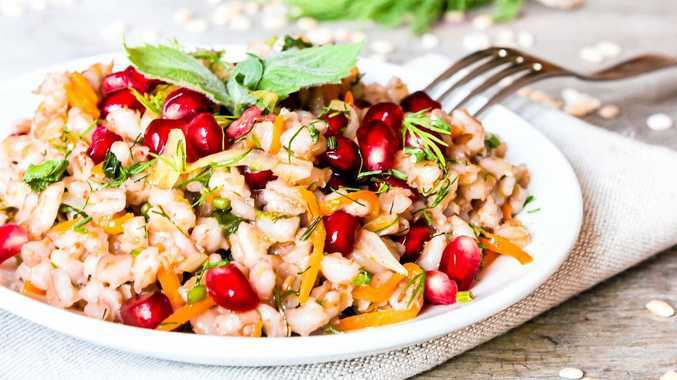 200g pearl barley; 1 tsp salt, plus salt and pepper to taste for dressing; 1/3 cup olive oil, divided; 1/2 red onion, finely sliced; 1 carrot, peeled and shredded; arils of 1 pomegranate; 1/4cup chopped fresh herbs (mint and parsley are good); 2 tbsp pomegranate molasses; juice of half a lemon. Bring a pot of water to the boil and add barley, salt and 1 tablespoon of oil. Return to the boil, reduce heat and simmer for 20-25 minutes. Drain and allow to cool. Heat a tablespoon of oil in a small frying pan and cosok onion over low heat for 4-5 minutes. Add carrot and cook for a further minute. Remove from heat and allow to cool. Combine barley, onion and carrot, pomegranate arils and herbs in a serving bowl. Combine remaining oil with pomegranate molasses, lemon juice, salt and pepper to taste in a screw-top jar and shake until combined. Toss through salad and serve.